On a very cold night of 31 December 1599, a group of 4 or 5 enterprising youngmen assembled in a dingy room of London and deliberated on forming a trading company in order to buy Indian condiments like ginger, pepper, coriander etc, in exchange of British woollen clothes, steel and iron products etc. Their deliberations lasted long and 1st of January, 1600 arrived. The trading company formed by these entrepreneurs on the night of 1599-1600 was known as East India Company. They soon arrived in India. By March or April 1600, they got the right of exclusive trade with India by a Royal Charter from Emperor Akbar of Mughal Dynasty. Sir Thomas Roe arrived at the Court of Jehangir in 1615. Thus, the roots of British conquest of India were firmly implanted. The battle of plassey was fought on June 23, 1757 and Robert Clive won an easy victory through treason and Sultan Siraj-ud-daulla took to flight, but was captured and beheaded. The district of 24 Pergannas was made Lord Clive's jagir (estate). By 1760, the districts of Midnapore, Burdwan and Chittagong were made revenue-free assignments for the British. The East India Company in 1765 also became the Revenue Collecting Minister on behalf of the Mughal Emperor for the provinces of Behar and Bengal. On September 14, 1762 Haridas Gossain, vakil of Raja Jai Singh (alias Bhagya Chandra) of Manipur on behalf of the Raja, signed a mutual trade and defence alliance with Harry Verelest, Chief of Factory at Chittagong, acting on behalf of the Honourable East India Company. This trade and defence alliance heralded Manipur's connection with the British. Bhagya Chandra Singh ruled Manipur from 1755 to 1789. In the winter of 1812, Raja Chourajit Singh of Manipur was driven out of his kingdom by Marjit Singh, his younger brother with Burmese help. Chourajit fled to Cachar (Assam). Gambhir Singh, another brother joined him. The two brothers soon took possession of large portion of Cachar kingdom, from Govinda Chandra, the Ruler of Cachar. In the meanwhile, Marjit Singh, the Ruler of Manipur fell out with his Burmese masters and the Burmese forces occupied Manipur in 1819. Thus began the infamous seven years' devastation of Manipur known as Chahi Tarret Khuntakpa in Manipur's history, when the population of Manipur was reduced to half due to torture, fleeing and killing. Marjit fled to Cachar, where he surrendered himself to Chourajit. He was pardoned. The three brothers, Chou-rajit, Marjit and Gambhir Singh joined forces and divided among themselves the whole Kingdom of Cachar. Raja Govinda Chandra, the deposed Ruler of Cachar, unable to get help form the British, turned to the Burmese. At Govinda Chandra's instigation and also impelled by the Burmese desire to capture the fugitive princes of Manipur, the Burmese forces, who by then, had occupied Assam too, invaded Cachar. The Brits then realised that if the Burmese were allowed to occupy Cachar too, the British Indian Empire would be in danger. So, they declared Cachar as a Protected State with Govinda Chandra as the Protected Prince. When this did not stop the Burmese from their raids, the First Anglo-Burmese war (1824-26) broke out in early 1824. The British, in their war against the Burmese, now decided to enlist the help of the Manipuri Princes, who were also keen to recover Manipur. Due to advancing age, Chourajit and Marjit abandoned the idea of war and the mantle, thus fell on Gambhir Singh and Nara Singh. David Scott, the Agent to the Governor General, negotiated with Gambhir Singh on behalf of the Honourable East India Company. Chourajit became jealous, and to stop the interference of Chourajit and also of Marjit, the British granted a monthly pension of Rs. 100/- each to them. Chourajit settled down at Nabadwip and Marjit, at Sylhet. To build up a force for the recovery of Manipur, the British raised the Manipur Levy, a body of 500 men (all Manipuris) officers, paid, trained and equipped by the British. They were all armed with muskets by the British. Captain FJ Grant and Lieutenant R Boileau Pem-berton were the officers. Gambhir Singh and his cousin, Nara Singh along with their men, were trained at Badarpur Camp. It was agreed by the British that when Manipur was recovered, Gambhir Singh would be the Raja (King) and Nara Singh, the Senapati (Chief of Army). The Temple of Shree Shree Govindajee was built by Maharaja Nara Singh in 1842 AD at Kangla. The British plan was to attack Burma from two fronts. While Major General Sir Archibald Campbell was to land his troops by sea route at Rangoon and advance northwards, Brigadier General Shuldham was to attack Burma through Cachar and Manipur. Shuldham's force of about 6000 men and a huge quantity of supplies, marched from Dacca in March 1824. Due to insurmountable problems of communication, disease and sickness, the force could reach only the western bank of Jiri river in Cachar and had to turn back. After the unsuccessful attempt of General Shuldham, Gambhir Singh who had earlier distinguished himself in the battles fought alongside the British against the Burmese, now proposed to liberate Manipur with his Manipur Levy. He convinced the British that his lightly equipped small force would have no problem of communication as faced by General Shuldham. The proposal was accepted and Lt Richard Boileau Pemberton was deputed to accompany the force. 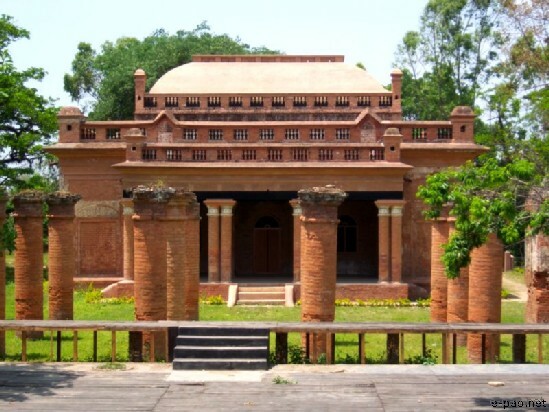 They left Sylhet on May 17, 1825 and reached the western outskirts of Imphal valley on June 10, near Bishenpur. En route, the strength of the invading army swelled up manifold by tribal volunteers with swords, spears, bows and arrows etc. In an encounter, many Burmese were killed and captured as prisoners. Gambhir Singh took possession of Imphal on 12 June and advanced to meet the Burmese forces, which had withdrawn to Andro, about twenty kilometres from Imphal towards the east. The Burmese fled and very soon, practically the whole of Manipur was liberated. Handing over the charge of protecting Manipur to Senapati Nara Singh with 300 Manipur Levy men and with 700 locally raised militia, Gambhir Singh and Lt Pemberton left Manipur for Sylhet in June. The news of the successful expedition against the Burmese pleased the British. Gambhir Singh came back to Manipur in December 1825 with reinforcements and 1,500 muskets. This time, Captain Grant accompanied Gambhir Singh. By February 1826, Gambhir Singh captured Kabo Valley. As roughly narrated earlier Major General Sir Archibald Campbell landed his troops at Rangoon on May 11, 1824 and pushed his way up the Irrawadi valley. By February, 1826, General Campbell occupied Yandabo, only 45 miles from Ava, the Capital of Burma. The Court of Ava negotiated for peace and the Treaty of Yandabo was signed on February 24, 1826. By this treaty, Gambhir Singh was recognised by the Burmese king as the independent and sovereign Raja of Manipur. This fact was confirmed by Mr Crawford, the British Resident at the Court of the Burmese King at Ava. The Capital of Manipur was located at Canchipur, where Manipur University is now located. The Manipur Levy was also stationed there. British influence on Manipur was exercised through Captain Grant and Lt Pemberton of the Manipur Levy. By the way, I suggest that the Archaeological Department of India/Manipur should take up restoration work of Canchipur Palace including the moat for boat race on the east of Indo-Burma Road as heritage structures. Of course, due compensation should be paid to the owners of lands. This will beautify the City of Imphal. Maharaja Gambhir Singh died on January 9, 1834. His son, Chandrakirti Singh was an infant of two years of age. The child prince ascended the throne with his uncle Nara Singh as the Regent. Nara Singh was a capable administrator and Manipur became a peaceful country. So, the Government of India decided to withdraw from the management of the Manipur Levy and instead, establish the office of Political Agency. Major Grant, the Commandant handed over the charge of Manipur Levy to the Manipur Government in 1835 and left Manipur. Captain Gordon, the Adjutant became the first Political Agent. Captain Pemberton, another officer of the Levy became Joint Commissioner, posted in Manipur. But the British continued to supply ammunition to the Manipur Levy. The duty of the Political Agent was to establish links with the British India Government and maintain friendly relations. The Capital of Manipur was shifted from Canchipur to Imphal (Kangla Fort) back in 1844. Dowager Maharani Kumudini Devi, the mother of infant King Chandrakirti was apprehensive that the Regent Nara Singh would usurp the throne. So, in 1844 a plot was hatched to kill Nara Singh, the Regent, while he was praying in the evening at the Brinamchandra Temple. Regent Nara Singh was an expert of Manipuri Martial Art of Satjal, similar to Kungfu of China. An expert of Satjal without weapon can meet and defend himself against attack by an adversary with sword or spear. The designated assassin of Raja Nara Singh, one Nobin Singh was caught and put to death. Kumudini Devi and the young Prince Chandrakirti Singh fled to Cachar and sought for the protection of the British. When this incident happened, neither Captain Gordon, the Political Agent, nor his assistant, Capt Pemberton was in Imphal, as they were inspecting the construction of a new road. Since the Kingdom of Manipur had to have a king, Nara Singh ascended the throne of Manipur and declared himself as Raja. Though the Government of India was not quite happy, it abstained from interfering in the internal affairs of this buffer State. Kumudini Devi's appeal to the British to restore the throne to her son went unheard. But, she was given an allowance of Rs. 100/- per month from Kabo Valley compensation. It may be mentioned here that Kabo valley, an area of about 7700 sq. kms. (one third of the present area of Manipur) lying between the Indian township of Moreh and Chindwin River (Ningthee river to Meiteis) was gifted away by the British Indian Government to Burma as per Treaty of Yandaboo (Feb 24, 1826) after the end of the First Anglo-Burmese war. Maharaja Gambhir Singh was not happy as Kabo Valley belonged to Manipur (now India) by the right of his conquest. But Gambhir Singh kept quiet, as he was not inclined to antagonise the British Paramount Power in India. Since the British India Government realised their mistakes and wanted to compensate the Kingdom of Manipur, an "Agreement regarding Compensation for the Kabo Valley 1834" was signed by Major F.J. Grant and Capt. R.B. Pemberton at Langthabal, Manipur on 25 January 1834, which stated that "a monthly stipend of five hundred Sicca Rupees, would be paid to the Rajah of Munnipore, commencing from the ninth day of January, One Thousand Eight Hundred and Thirty Four, the date on which the transfer of Kabo Valley took place." Further, this agreement stated "that should and circumstances hereafter arise by which the portion of territory lately made over to Ava, again reverts to Munnipore, the allowance now granted by the British Government will cease from the date of such reversion". When India became independent on 15 August 1947, Kabo Valley compensation was continued to be paid to the Manipur Government under Maharaja Bodhchandra Singh by the Dominion Government of India, as successor Government of the British Paramount Power. Pandit Nehru, our Prime Minister transferred Kabo Valley permanently to Burma in 1953, as a gesture of goodwill to Burma. Since then payment of compensation had stopped. He did not even consult the then GOM. Nehru pandered away Indian territories whimsically. Again, in the winter of 1962, when People's Liberation Army (PLA) of Mao Tse Tung invaded Arunachal Pradesh and Aksai Chin area in Ladakh, our Prime Minister's address to the Indian Nation was not inspiring. In his AIR broadcast, he sang condolence song for all the people of NE India on their impending peril and added that Aksai Chin area was a rocky and barren area where not even a single blade of grass could grow. The P.M. should have said that India would fight the Chinese till they were driven out of Indian territories. A leader should exhibit courage, not despair and promise to defend Indian territories. On India's request indeed, consignments of U.S. weapons arrived at Koirengei airfield, Manipur, so that Indian Army could fight the Chinese. A heart-broken Pandit Nehru died in 1964. Now, coming back to Maharaja Nara Singh, I consider him to be a distinguished man and an able king of Manipur of the highest order. He was a very brave person, dedicated to the cause of Manipur. He would give in, to the British when circumstances were unfavourable. He knew the time when he was to be aggressive and when he should be submissive. He did not appoint anyone as Yubaraj as heir to the throne of Manipur, as this would conflict with Chandrakirti's claim to the throne of Manipur. He was faithful to Maharaja Gambhir Singh and the son, Chandrakirti Singh. Indeed, if Manipur continued to be ruled by Maharajas like Nara Singh, we, Manipuris could have been a free nation like the Bhutanese, who are still enjoying independent status, but maintaining a cordial, cultural, religious, defence and external affairs connection with India. Glory to Maharaja Nara Singh. Jai Hind ! * Haobam Bhuban Singh wrote this article for The Sangai Express . This article was webcasted on May 04, 2011.